Town lots on Sixth Street between Oregon [Santa Monica Boulevard] and Arizona Avenues, serving as the site of the offices of the Board of Education, had been donated to the school district by Senator John P. Jones and Col. Robert S. Baker, who had developed the original town site of Santa Monica. On these lots the first school building was erected in the summer of 1876, and was ready for occupancy upon the opening of school in September of that year. For over fifteen years the Sixth Street School was the only public school in the area of Santa Monica. Many of the boys and girls had come long distances to attend classes. They came from the areas now known as Venice and Ocean Park, east from the area of the Soldiers home, and from several canyons north of Santa Monica Canyon. Many of the children rode horseback, tying their horses to a hitching post in front of the school. Others, it was reported, boarded in town during the week, in order to partake of the opportunity of attending school in Santa Monica, and returned home on weekends. 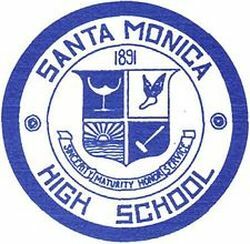 Historically, it would appear that the Santa Monica High School had its beginnings in 1884 during the principalship [sic] of W.W. Seaman, when a third teacher was hired and the principal began to teach high school subjects to those pupils who had continued to add to their education. 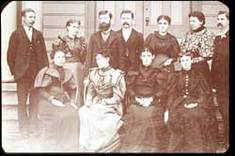 Even though those receiving diplomas in 1887 might be regarded as the first class to graduate from the Santa Monica High School, actually it was not until 1894, when the Santa Monica school had been approved and established under the Union High School Law of 1891, with a four-year course of study, that the first class was traditionally graduated from the high school. The high school continued to occupy rooms in the Sixth Street building until 1898. The increase in numbers of school-age children gave the tax-payers little choice but to provide additional schools. In 1897, the first school bond issue approved a $15,000 building program for the Lincoln School, which became the first high school. 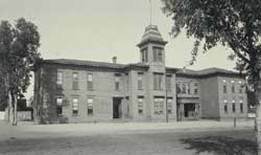 The Lincoln High School opened in the spring of 1898, with Nathan F. Smith continuing as principal, and the building was dedicated at the June graduation exercises that same year. But long before the plan to provide secondary education in Santa Monica had been consummated, sharp criticism had been leveled at the trustees for their choice of a building site. One objector said: "This is ridiculous [sic], why build a school away out in the country? It will be twenty years before this town is settled enough to need a school that far out." It may be remarked in passing that the new school was to be located four blocks east of the existing Sixth Street School. The site on which the Lincoln School stood had a 220-foot frontage on Tenth Street and a 150-foot depth on Oregon Avenue [Santa Monica Boulevard], extending to an alley. The trustees planned to buy lots on the other side of the alley in order to gain a solid frontage for the school playground. But a lumber merchant near by objected to the closing of the alley because his teams and wagons found it convenient to turn there. Thus, for a long time, the Lincoln School graced one side of the alley and the playground the other. At a later date, however, the trustees bought the entire block for school use. This site is now occupied by the Madison School. On December 12, 1910, a resolution was adopted by the board of education declaring its intention to call an election for a $200,000 bond issue. 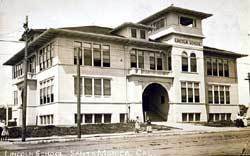 On the same date, another resolution was adopted declaring the board's intention to establish the high school on Prospect Hill located between Fourth and Sixth Streets and between Michigan and Fremont [Pico Boulevard] Avenues. Prospect Hill, a spot rich in local history, had been selected for the high school site partly because of its location midway between the two sections interested in it, and partly because of its topographic features. At its crest, the hill stands 120 feet above sea level, and offers a view of the entire city. After a lively campaign, in which the women of the city again played an important part, the election was held on Tuesday, January 24, 1911. Bonds in the amount of $200,000 were voted to this high school district to meet the cost of a new site and the necessary buildings to establish the high school on the top of Prospect Hill. Out of the 875 votes cast, 768 favored the bonds. Santa Monica pronounced it a gala day when the cornerstone of the new high school was sealed into place. The ceremony was held on April 11, 1912, and was witnessed by nearly one hundred county and city superintendents from various parts of the state. A luncheon was served at the Seaside Hotel for the superintendents, city officials, school personnel, and distinguished guests, after which the whole town turned out to witness the ceremonies incident to the laying of the laying of the cornerstone. 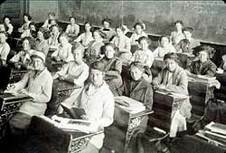 The formal dedication of the new high school took place on February 23, 1913, at two o'clock in the afternoon, Mrs. D.G. Stephens, then president of the board of education, presiding. The Reverend Lislie Lebinger offered the invocation, Superintendent Horace M. Rebok presented the dedicatory address, and Mrs. Stephens made the formal dedication of the school. Frank W. Thomas, elected in 1911, was the first principal of the new high school, which opened in its new location with an enrollment of 450 students and a staff of twenty-three teachers. The following spring more than a dozen teachers were added to the staff to meet the requirements of an increased enrollment. In 1921 the Memorial Open Air Theatre was added and dedicated to the memory of Samohi boys who were in World War I. In 1924 the Library Building, now the English Building, was added. Buildings sustained damage in an earthquake in 1933; in 1934 an extensive remodeling and modernization job was begun which required students to attend classes in tents for several years. The renovation was completed in 1938 along with the construction of a 1400-seat auditorium, which has served both Samohi and the community well. In 1944 the auditorium was named for W.F. Barnum, Principal from 1914 to 1943. 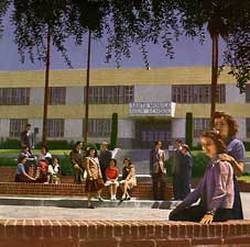 In 1952 when Santa Monica City College left the location adjacent to the high school, Samohi acquired its campus. Additional land was purchased, and today the campus covers 33 acres. The Science and Technology Buildings were built on the SMCC site. In 1969 two construction projects were completed: an Olympic-sized natatorium and enlargement of the Greek Theatre to a seating capacity of 3558. The fall of 1971 saw the completion of the new Language and Library Building. Beginning June 1993 Samohi saw major construction again as proposition ES work began. The result of the efforts of many people through the years is a rolling campus uniquely set just four blocks from the Pacific Ocean.